Mr Siddaramaiah boasted about having scripted several national firsts across key sectors through a unique model of development. 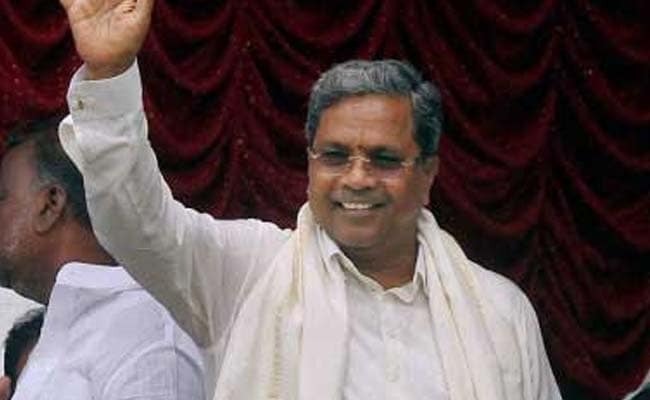 Bengaluru: Ahead of Prime Minister Narendra Modi's public rally in Bengaluru, Karnataka Chief Minister Siddaramaiah today asked him to "find time" to resolve the inter-state Mahadayi River water row with neighbouring Goa. Claiming that Karnataka is the number one state in investment and innovation, and highlighting Bengaluru as a start up and innovation hub, Mr Siddaramaiah boasted about having scripted several national firsts across key sectors through a unique model of development. "I welcome PM @narendramodi to Namma Karnataka - the no.1 state in investments, innovation & progressive policies.. Through a unique model of development, we have scripted several national firsts across key sectors," Mr Siddaramaiah said in a tweet. "I am confident that Karnataka's success makes India proud," he said. "@narendramodi, I am glad you are making time to visit the country's start up & innovation hub, Namma Bengaluru today..On behalf of my people, I urge you to find the time for Karnataka's drinking water needs & help us resolve the #Mahadayi dispute #NammaKarnatakaFirst," he said in another tweet. Responding to Chief Minister's tweets, state BJP Chief B S Yeddyurappa alleged that Karnataka has scripted several firsts like corruption, farmers suicide and collapse of law and order under Mr Siddaramaiah's regime. "Thanks for the welcome CM @siddaramaiah avare! Yes. Karnataka indeed has scripted several firsts - No.1 Corrupt State, 3,500+ farmer suicides, collapse of law & order, mysterious deaths of officers, transfers of honest officials, crumbling infra of Bengaluru. #KarnatakaTrustsModi," he said in a tweet. Karnataka has for long been demanding Prime Minister's intervention in resolving the inter state Mahadayi river water sharing dispute by calling a meeting of chief ministers of riparian states that includes Goa and Mahrashtra. Various Kannada organisations and farmers groups have called for "black day" today alleging that the prime minister was not heeding to their demand. Recently 'Kannada Okkuta,' an umbrella organisation of various pro Kannada organisation along with farmers' groups, had called for dawn-to-dusk Karnataka bandh on January 25, demanding the prime minister's intervention. Their plans earlier to observe bandh today also, on the day of prime minister's visit had failed with the Karnataka High Court on Friday issuing the stay on the shut down after terming it as "unconstitutional". Karnataka, which has locked horns with neighbouring Goa on sharing Mahadayi River water, is seeking release of 7.56 tmcft water for the Kalasa-Banduri Nala project. It involves building barrages across Kalasa and Banduri, tributaries of Mahadayi River, to divert 7.56 tmc ft water to Malaprabha which meets drinking water needs of the region. Attempts have been made by Karnataka to amicably solve the issue that is also pending before the Mahadayi Water Disputes Tribunal.